Rebecca Aponte, a home-schooled sixth grader from Blue Hill, placed second in the Maine State Spelling Bee on March 23 at the University of Southern Maine. 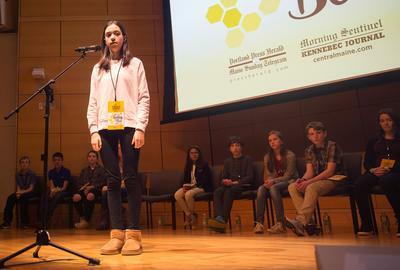 Rebecca Aponte, a home schooled sixth grader from Blue Hill, once again traveled to South Portland on March 23 to attend the Maine State Spelling Bee. This time she wasn’t watching her big brothers but spelling words like “pickelhaube” on stage. She earned her seat on the USM stage by winning the Hancock County Spelling Bee in February. Brothers Brandon and Colin each competed at the state bee, coming in second on their first attempts and winning the championship on their second, Brandon in 2013 and Colin in 2018. “I was really excited to finally be in the state spelling bee this year because I had been watching from the audience since I was 6 when my brothers were competing,” Rebecca said. The 15 spellers representing each county in Maine, except Waldo, ran through more than 1,100 words, with the final five going the distance from round 16 to round 38. Then the judges went off the list of words provided by Scripps National Spelling Bee and used by contestants to prepare for the bee. The bee went over 50 rounds and lasted three-and-one-half hours to produce the 2019 champion. With two more years of eligibility, Rebecca could continue in her brothers’ footsteps even further—both went on to compete in the National Spelling Bee in Washington, D.C.